Monday, I'm not here...knock again on Tuesday! Bubba discovered "Sweet Child O' Mine" by Guns N' Roses on Friday. He is one of those that gets into lyrics and will have the song memorized within the next 4 times he hears the song. It is such a sweet song, mainly meant for daughters, but I told Bubba that he was my sweet child of mine...He responded "No, this is my song for Vivian. It makes me think of her." I just thought it was the sweetest thing. There is no doubt he is going to be an amazing big brother. I took one of my besties out for lunch Friday afternoon because she is leaving the university that we both work for. She has a new opportunity and I am so excited for her. We have been friends since she started working at the university and I am so thankful for her friendship! 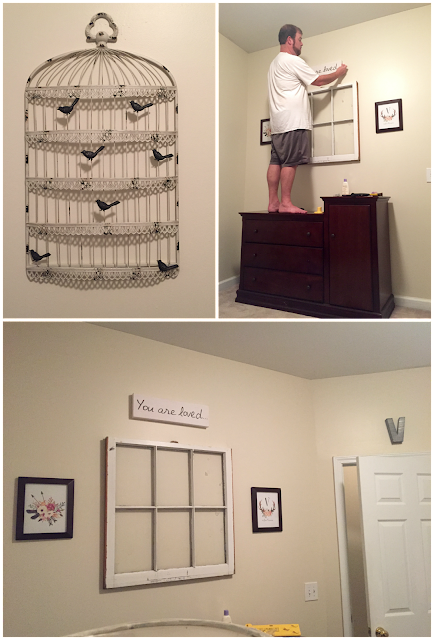 Hubs has been working hard on the nursery giving it a fresh coat of paint and hanging up some of the items that I have been stashing away for the walls. We still have a lot to do, but it feels nice to have the nursery at least ready enough in the event of an early delivery! One major change coming to the nursery is some much needed color! Bubba had his first baseball practice of the season on Saturday and did phenomenal. He is on a team with two of his buddies from his spring ball team and I can already tell it is going to be a great season. He has really improved in all areas of the game since the spring. He got to try pitcher position at the first practice and it fit him like a glove. He really enjoyed it. It is miserable sitting in the sun during ball practices and games during late summer, but boy is it worth it! 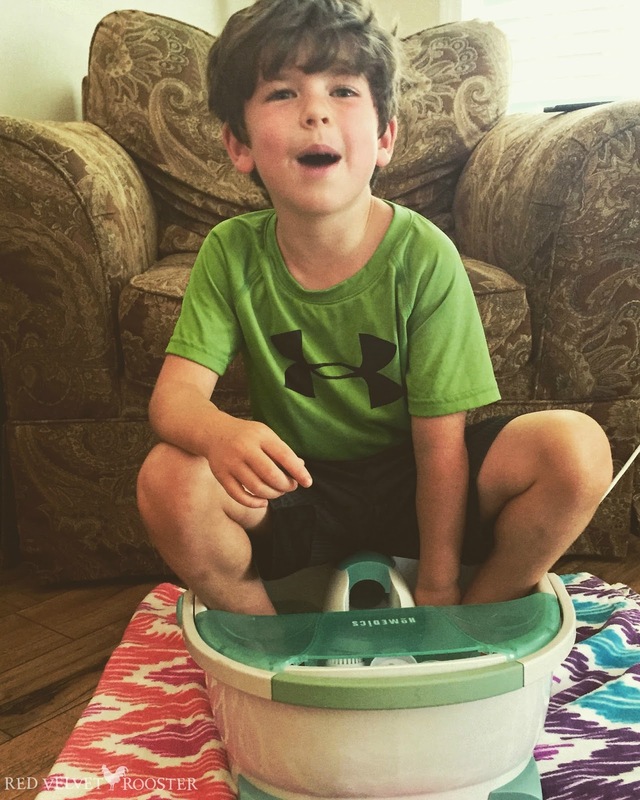 After a very hot practice, Bubba requested a cool foot bath...I obliged! We had Hub's friend of 20+ years, his wife and kids over for supper Saturday night. Bubba and his son were born 14 days a part, so they always play really well together. They also have a little girl who was smitten with the hubs! The kids played really well together and the parents had a chance to eat a meal and actually have some adult conversation. One of the great things about living in hubs smallish hometown is the old friends of his that I have gained. We had movie morning! We watched Man of Steel and hubs cooked scrambled eggs and bacon for Bubba and me. I ate all the eggs he put on my plate, only to find out he had put 4 eggs on there!!! I ate every bit of them! After breakfast, I put a bunch of chicken breasts and a box of stock in the crock-pot to cook all day so we could have prepared shredded chicken for our meals throughout the week. Now that fall ball has started, we have to be ON TOP of our game. This week we will be having two nights of Greek Lemon Chicken Soup along with side salad and Oven Chicken Tacos! 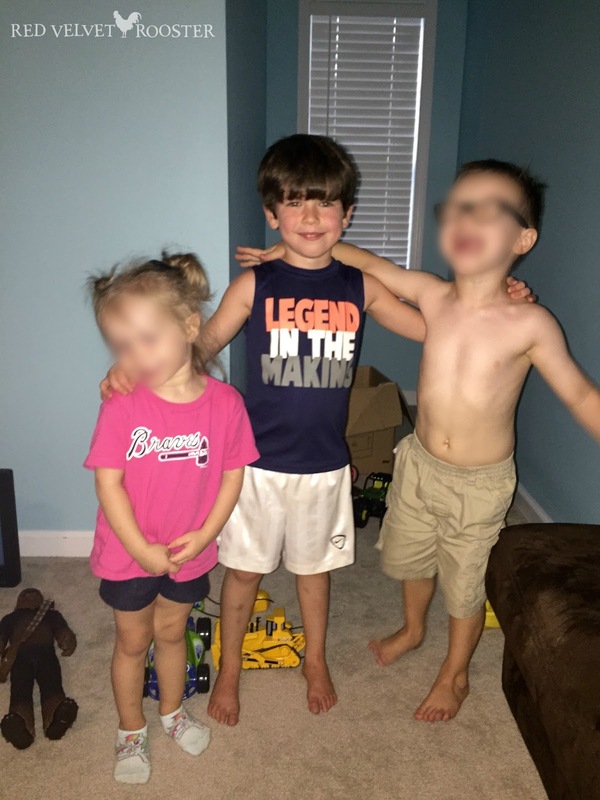 After movie morning, hubs got ready to go play golf with the friend who came over the night before and Bubba and I spent the afternoon at the pool. After we finished at the pool we went out to the garden and picked 5 huge watermelons along with some other produce such as okra, peppers and eggplant. 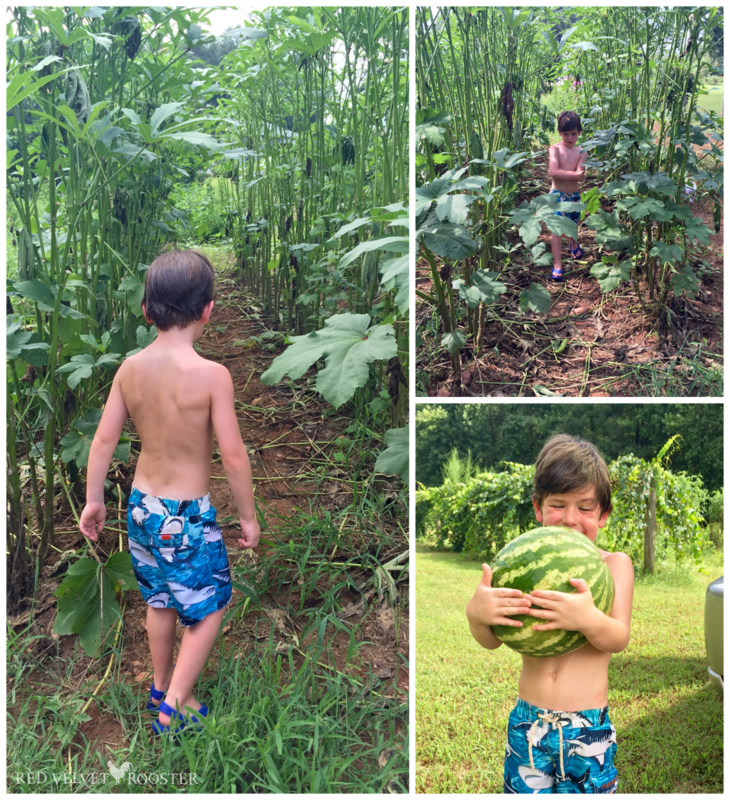 We really enjoyed having the chance to grow a big garden. It would not have been possible without the help of my Mother-in-Law, especially her letting us use her land to do it! Looking forward to the day we move a little further out to the country, somewhere on hubs homeplace property. After pool and garden, Bubba and I came home to start on homework for the week. We worked on his sight words and also on his poster project that is due on Friday. We have finished all the writing for the poster, now he just needs to decorate it and make it colorful. Bubba has a test every Friday on his sight words and so far he has made 100% every week. It is a struggle sometimes to get him to work on his sight words, because he gets upset when he doesn't get it right the first time, but overall he has been such a champ! Check out my Kindergarten Pinterest board with ideas on how to support your Kindergartner's learning experiences!